Just a few hours before the Near Deere Give Away! Join us at 8PM Central US.... January 11, 2019! ...headed down the road to Carrollton and a chance for trout... except struck out on trout. But, did lots of scouting around; there is a big pond, a small pond, a medium pond, a river, and a wider part of the river that all look like they may hold fish at times. Although we struck out on trout, did catch fish #1, #2, #3, and more from a drainage creek that fed into the big pond. Sunfish and Bluegill were going for an Olive Near Deere! While there, saw Carrollton is using the drainage filters that trap debris before it can enter a pond or lake! Good Stuff! Longer video... but lots to show! Check it out when you get a chance! I also struck out on trout at Waterloo Park and on striper fishing below Denison Dam yesterday. I think the strong cold front that blew thru Friday night had something to do with it. Bummer, just got back from both Waterloo and Denison... struck out today. Very cold, too. Had to wear multiple layers and put on gloves. Hope to have better luck next round! Made the run up the road on Hwy 75 to Denison to fish Waterloo Park Pond for Rainbow Trout. Restocked last weekend, plan was to limit out, and then run further up the road to Denison Dam tailrace to fish for Striped Bass. Cold temps that stayed in the 30s all day put a slowdown on the bite. Ended up striking out at both Waterloo and Denison Dam. No worries... had a great time at "casting practice" with the new TFO 6wt Fly Rod and the Cabelas TLR 6wt Switch Rod. No fishing today but did get the chance to post a video to answer the mail... question on what fly reel we use. From the jest of the video, we hope we answered the mail... Echo Ion Fly Reels! Why we like Echo Ion Fly Reels. More Near Deere Give Aways... this one is round three for 2019! Do join us for the random drawing! Near Deere Give Away went well - Congrats to the Winner! With the weekend here, not sure where or when we plan to go fishing. But, might as well prepare for it. Put an OPST Commando Head with a coated running line and Airflo extra fast sink tip on the 6 weight. Hope to see how it casts with the heavier shooting head and coated running line compared to the 5 weight that has a lighter shooting head and mono running line. Will post video of how it does while out and about fishing! More to come! Yesterday's practice casting of the 6wt TFO Fly Rod was a fun time at Bethany Lakes. But, was sidetracked by a school of bass lurking in the hole by the drainage pipe in the Back Pond. After 11 fishing flies later, found a pattern that worked... caught one Bass but fouled hooked it. When up the road to Bethany Creek Pond, had another Bass take but broke off. Did notice the Bass was sulking near the pond's brick wall. Able to grab it by hand, and then move it closer to the water fountain where the water had more flow and aeration. Released it with no issues! Really like this setup. Going to plan to use this in place of the 5wt... retired to the closet after many fun seasons! 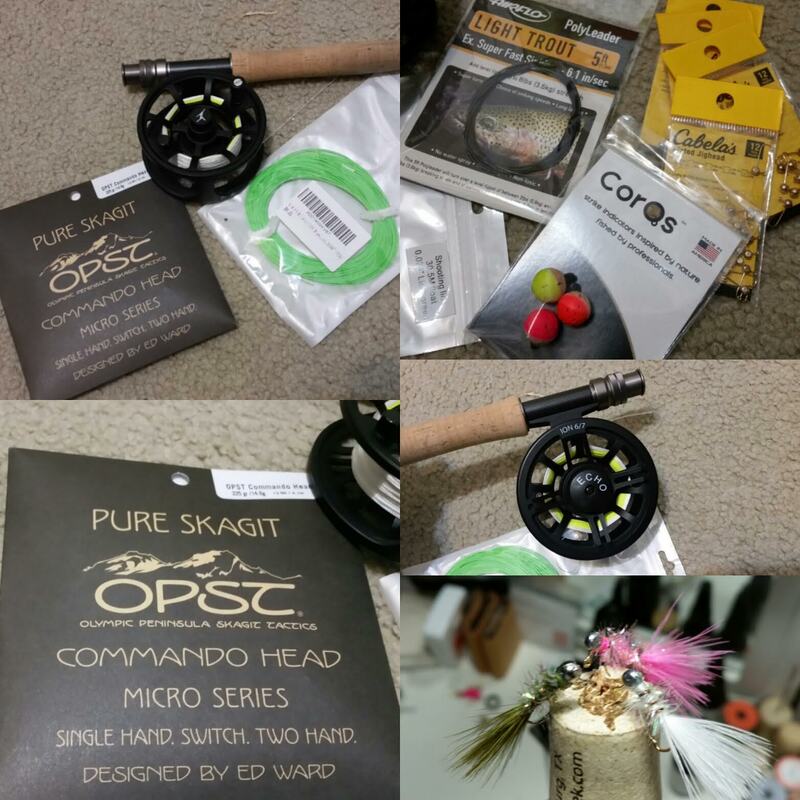 BETHANY LAKES, OPST COMMANDO HEAD, TFO 6WT, AND 11 FISHING FLIES! After trying different strike indicators over the years, settled on this find - the Corqs Strike Indicator! Made out of cork and a rubber O-ring; it does not slip and casts well. Do check out our product review of the Corqs Strike Indicator where we talk about why we like it as well as detail other strike indicators that we have used in the past! Corqs Strike Indicators get an "Alrighty Then" Rating from the Team. We will buy these again! Why We Like Corqs Strike Inidicators...! Able to get a round of trout fishing at Rowlett Community Park Saturday morning. Was a tough go with temps in the 30s and a slow bite. After several hours found the pattern... a slow swing of the rod to move the Near Deere / Powerworm slowly through the water, had several bites, and then a trout struck and was on briefly before throwing the hook! Kept at it, and managed to finally hook and land two trout. Lost the Powerworm but luckily trout kept striking the Near Deere; just kept missing the hook sets! PS: Do check back, next Near Deere Give Away is for two White Near Deere in the 1/80oz weight and a Marilyn Monroe Tenkara Fly! Cold Round Trout Fishing Rowlett Community Park! Here is a website - http://www.iFishNews.com we maintain that is more a fishing information and news aggregator than a traditional website or blog. It has fishing info and reports from our area in North Texas and Oklahoma as well as fishing information around the USA and other parts of the world. "How We Stay Aware of Fishing "Happenings"... #ifishnews"
This round we are giving away two White Near Deere tied on 1/80oz fly jigs and one Marilyn Monroe Tenkara Fly. The extra weight of the 1/80 oz fly jigs helps fishing deeper spots when the trout are lurking deep. And, the white color is what we had the local trout interested in last Saturday when the temps were well below freezing! To win this round... we wrote down a number from 1 to 100 on our whiteboard. First to guess the number and post in the comments either on this video or on our Facebook Page wins the number we wrote down wins! That is first to guess the number with a US address wins! PS: Cold morning tomorrow but thinking about checking out Frisco Commons in the morning! Ukulele and Q&A and Near Deere Give Away! Cold temps Saturday morning – February 16, 2019! Decided to go a round at Frisco Commons for some recently stocked Rainbow Trout. Trout derby was held last weekend; was not able to make it. Temps were in the low 30s, had to bundle up well… layered clothing did the trick but still forgot the gloves like last weekend when we fished Rowlett. Fished from 8:30 to 4:30, caught and released five trout. Lost several others while bringing them in, and had a lot more missed hook sets. Still lots of fun, and was able to limit out for the first time this year… woohoo! PS: Near Deere Give Away is still in-progress… do give it a go and guess a number from 1 to 100 and post in the comments on our YouTube Channel – COAF Field Team! Updates from the Field Team on recent activities. Do check it out when you get a chance!